Trustees' Annual Report, Treasurer's Report and the Accounts for the year to December 2017: accepted and approved. They will be available on this site in due course. Election of named Trustees for three years until 2021: Elizabeth Storey, Hugh Woodhouse, John Williams and Jan Mulreany stood down as Trustees and were re-elected en bloc by the participants. The two Charity appointed Trustees were confirmed as Pamela Hubbard (Patcham U3A) and Mary Taylor (Patcham WI). Funding of and planning for continuing maintenance of the hall. Trustees will continue to seek and apply for capital funds to finish the renovations by the end of this calendar year; a Fire Risk Assessment requires isolation of electrical circuit board and linked equipment as a priority. Plans/programme for “Celebrating the Peace” at the War Memorial Hall – centenary of the Armistice, on 10 & 11 November 2018: a draft programme is on our Celebrating the Peace page, and the final format will be published in Patcham Post and elsewhere in the Village by the end of August. We are seeking sponsorship of a number of "Pax" roses, as introduced by the Rev Pemberton in 1918 to mark the end of the Great War, to be planted in the Hall's gardens, and will be in touch with local businesses. No agenda items nor any other business was raised by participants in advance or tabled at the meeting. It was originally founded in memory of the local men and women who went to the Great War, and it has been serving the village and parish of Patcham since 1924. It has a fascinating history, including being requisitioned for the Second World War effort in 1939. 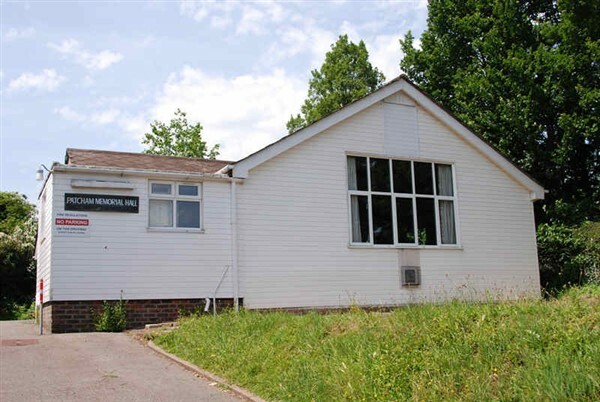 Patcham Memorial Hall is booked out regularly each week or month on specific days to the groups listed above, and others. You'll find a list with contact details on the Regular Groups & Clubs page. We are happy to hire out the hall any day and time that it is available, from 9am til 11pm, for all sorts of meetings, music and singing sessions, parties and family celebrations, concerts, dances, training and development groups, private and commercial functions. We have a large single hall that seats 100 people, fully fitted kitchen and cooking spaces, cups and saucers, an easily accessed stage, even fairy lights! You can see photos of the inside are on the Facilities & Fees page. We are just off the A23 as it enters the City of Brighton and Hove, and near the southbound exits from the A27 Worthing to Lewes bypass. The Hall is a white wooden building, tucked next to Patcham House School, half way along on the west side of Old London Road, parallel to the A23. There is lots of parking, though we are in a residential area, so please take that into account. BUSES the 5A from Brighton city centre stops right outside, and just up the road by the Co-operative shop. It's also the terminus for the 56 from London Road shops. Longer-distance buses 17, 33, 40, 271 and others from Haywards Heath, Horsham, Gatwick, and other places north of Brighton stop on the main London Road, near the Black Lion / Harvester pub, and at the south end of Old London Road. Here's a link to the bus map. TRAINS come to Preston Park Station, direct from Brighton, Hove and trains to & from London. The Hall is a 15 minute walk northwards on the main road. The 5A and other buses pass near the station, and are quite frequent. Please contact John Williams the Bookings Secretary, to discuss your requirements, emailing bookingspmh@gmail.com or text your message to 07818 455227. Let him know the date and exact length of time you want to hire the hall, and details of the event you want to run, as this helps us calculate the hire fee. Letters can also be put in the Letter Box outside the door, which is emptied every couple of days. Please go to the Facilities & Fees page for further details of how we charge and contract hirers.